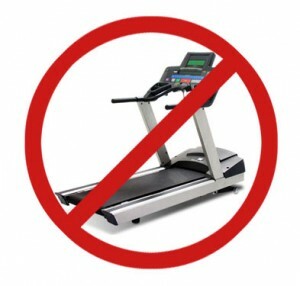 Are Treadmills Keeping You from Meeting Your Goals? Many patients are aware of my hobby and passion for running. This passion comes with a caveat – as long as it’s NOT on a treadmill. Treadmills are a painful, real-world metaphor for a stuck life. You get on them, exert all kinds of energy, and wear yourself out but never actually go anywhere. Ugh. Unfortunately, that’s how so many people run their day to day lives. They have a treadmill lifestyle. They exert a lot of energy. They put in a lot of work. BUT THEY AREN’T GOING ANYWHERE. Instead of getting caught in treadmills of life, aim to make small moves forward each day that can make big differences! Now there are many potential reasons for this. One of the common issues is a lack of aim. People stuck in ruts often are letting life dictate where their energy goes instead of deciding that before they ever start their day. There are a lot of things you could do with your day. NOT everything is of equal importance. If you don’t identify and prioritize the important things, they will likely go by the wayside. Do that long enough and you find yourself at the end of another year with little to no progress to show for it. Frustrating. All four of these are uniquely important, and all four feed off of each other. And the fun thing is, all four of them can be looked at each day, and you can ask yourself “did I improve this pillar of my life?” If yes, great! If not, no worries, you can work on it tomorrow and identify what challenges were in the way to avoid those obstacles in the future. If you are looking to make real changes in 2019, and not be stuck on the treadmill of life, you might want to take aim on these pillars, and strive for 1 or 2 activities each day to strengthen them. Those small actions can make big difference.